XFX introduced its Radeon HD 7700 family. It includes the standard Core Edition, an Overclocked Black Edition and also a Black Super Overclocked Edition. 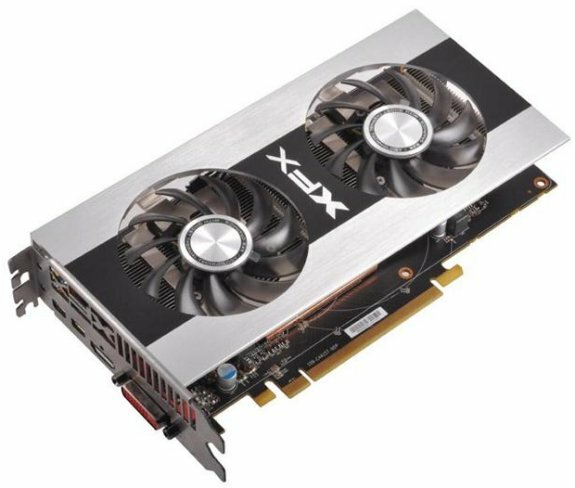 XFX launches an industry first with the introduction of its Super Overclocked graphics card as part of the AMD Radeon HD 7700 series. The range will feature a standard Core Edition, an Overclocked Black Edition and, one of the fastest 7700 graphics cards available today, the Black Super Overclocked Edition card with 1120MHz Clock Speed. Both HD 7770 and HD 7750 are available in three Performance Tiers: Black Edition for the ultimate enthusiast wanting to push the performance to the limit, Double Dissipation Edition for the quietest and coolest, and Core Edition for mainstream gaming. And each of these products features some exciting advancements, bringing new highs to the entire graphics card industry, including major upgrades to performance, power efficiency, speed, cooling, architecture and visual effects. The 7700 cards feature Ghost Thermal Technology, featuring an attractive floating cover that allows air to travel freely, cooling the PCB and components directly, while efficiently exhausting heat. All XFX cards now include ZeroCore Technology support, allowing it to give PCs a 95% idle power reduction, when no fan or card needs to be used. Another exclusive feature is the all-new PowerTune performance management utility. This feature can adjust the voltage and core speed to match application type, finding the perfect balance when games demand more processing power. This feature also allows the user to control TDP performance ranges. XFX cards also feature the very cutting-edge of graphic sophistication. With its Partially Resident Texture features, the most realistic textures now can be partially loaded in memory for quicker access to free up GPU resources. Implemented via the hardware, greater texture detail and depth is now possible and larger textures can be more efficiently used on a much larger scale. Additionally, an exciting Hollywood special effects technology, previously used in blockbusters like Hancock, Sherlock Holmes, A-Team and the upcoming 2012, are available to gamers through the Bullet Physics Engine. This standard for game physics, provides more realistic collisions, water flow, waves, weather and other environments. It also allows gamers to destroy buildings and other in-game objects with ultra-realistic details. Unlike other industry engines that lack proper CPU optimization and are proprietary, Bullet Physics Engine is Open Source and the choice of game developers and movie special effects houses. Many of the new XFX features are elements that allow for the next generation of technology to be seamlessly incorporated into the design. All XFX cards are PCI-E 3.0, anticipating the next generation of the PCI bus type that is faster and uses less power. Each XFX card is also HD4K ready, being the first card available to mainstream consumers. Previously priced out of the consumer market, HD4K technology gave only the military and air traffic industry the ability to see graphics clearly from a great distance for precision airstrike and landing maneuvers.